He is 30 year old who lost the sight of his right eye in early childhood due to Bow and arrow injury. 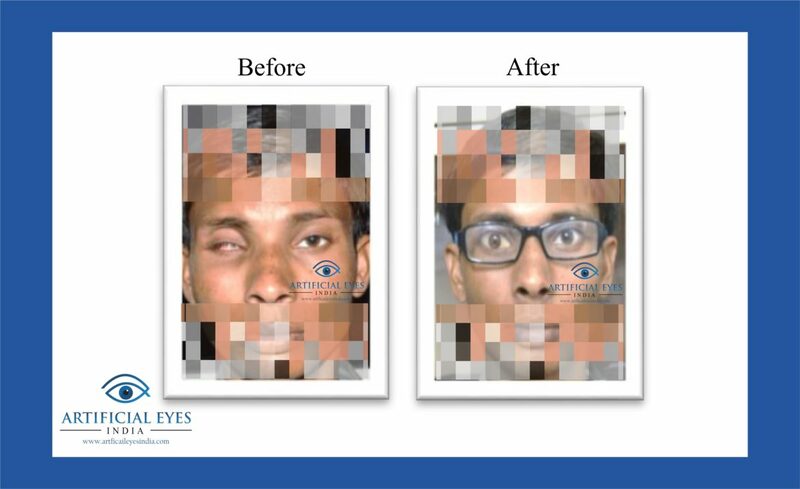 For further years damaged eye became more and more disfigured, but he could not face having it removed. He could not find the advice he needed but in the end his GP introduced him to a man who had lost his eye some years before. This man had had his prosthesis made by us and was able to tell that wearing an artificial eye was not as bad as most people thought. This information was enough for him to pluck up the courage to go ahead with the evisceration of eye. He felt better after making the decision but wishes that some professional counseling had been available to help him. When he attended his annual appointment for checking and re-polishing two years later, it was obvious that socket had changed shape. The prosthesis was comfortable but gazing outward due to atrophy of the remnants of eviscerated eye. But still he was quite happy with it…and wanted to wait for another year.